July 29, 2012 by Alphageek in "alphageek", "discovery"
We stopped by the grocery store, a Giant grocery store. Well, I don't know if it is large or not, but those things can be measured, but the name really is Giant. Giant is on the sign, the receipt, and all over the store, so I am pretty sure I got the name down. We walked in a different door than usual, and noticed that Giant is offering something new, SCAN IT. SCAN IT allows you to scan your own items, bag them, and then simply pay on the way out. Mrs. alphageek said we should give it a try, so we started out by scanning our Giant customer card. No, we did not scan it with the scanner we were going to use, there is a different scanner, just for your customer card. I am sorry if you are confused, but it makes sense when you go to use it, because the clear instructions are right there. If you can't read, well, you are not looking at this site anyway. So the card was scanned, and the little screen said "welcome alphageek". Well, not really, but that would be cool if the screen said that. Instead, one of the scanners lit up, and we removed it from the display. The very first thing I noticed was the little device starts out by showing some coupons. I scrolled through the list of coupons using the up and down buttons. This part might be too hard for you, if you think "smart phones" are complicated. The rest of you might like getting to see what coupons have been customized, just for you. The convenience of not having to mess with paper coupons gets the alphageek in a good mood too. 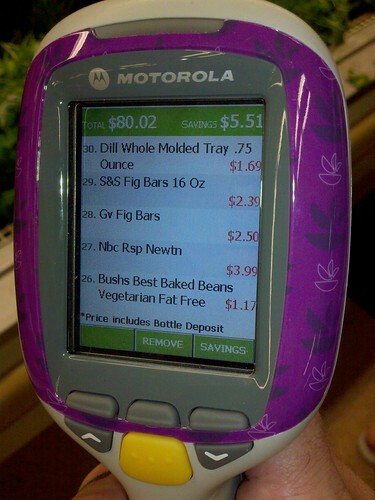 We walked around, scanning items as we dropped them into a bag, and we could watch the total as it increased. The scanner worked very well, but it did lose communications a couple of times. Given that I know how communications work, I tried moving a few feet, and scanning again, and the problem was solved. While we were using the scanner, we ran into a mother and young son using another scanner. She said it was great for little children. Mrs. alphageek replied that a scanner was great for the alphageek too. This way, the alphageek did not wander off and get lost while shopping. In today's large grocery stores, it can take a while to find each other again, if a couple gets separated. We did notice that new coupons appear as you walk around the store. I guess the store is trying really hard to get you to buy more while you are there. After scanning some Fig Newtons, a coupon for milk came up. Imagine the possibilities. You could scan ice cream, and chocolate sauce could come up. Scan some beer, and pretzels could come up. The possibilities are almost endless. We included a picture of the scanner below. You will notice some fig bars. A sharp reader might remember that the last post was about Newtons vs. Newmans. Perhaps this is a bit of foreshadowing? The underlined text is a link you can click on to to see the post. I know most of you know this, but we have readers that really don't know. We went to the checkout, and scanned the checkout barcode. Everything was entered into the checkout in about ten seconds, and a receipt printed. We simply paid with a credit card and were on our way. Checking out was fast because we did not need to scan everything, and the groceries were already in a bag, ready to go. This scanner is certainly something we will use again. We found it fast, accurate and convenient. Perhaps in the future, one could just use their own smart phone, and speed things up even more?